Fatpaint is a free, online (web-based) graphic design and desktop publishing software product and image editor. It includes integrated tools for creating page layout, painting, coloring and editing pictures and photos, drawing vector images, using dingbat vector clipart, writing rich text, creating ray traced 3D text logos and displaying graphics on products from Zazzle that can be purchased or sold. Fatpaint integrates desktop publishing features with brush painting, vector drawing and custom printed products in a single Flash application. It supports the use of a pressure-sensitive pen tablet and allows the user to add images by searching Wikimedia, Picasa, Flickr, Google, Yahoo, Bing and Fatpaint's own collection of public domain images. The completed project can be saved on Fatpaint's server or locally. Fatpaint is affiliated with Zazzle. Fatpaint was launched in May 2010, after five years of development by Danish-Brazilian software developer, Mario Gomes Cavalcanti. Cavalcanti, the CEO, graduated as an Object Oriented Software Developer and worked in the computer games industry. After his departure, he was involved in the development of two of Denmark's most visited websites and is responsible for developing and running Fatpaint. Partner Kenneth Christensen mastered assembler and graphics programming on the Amiga computer. He spent years with Mario on the Amiga demo scene. According to the CEO, Kenneth helped him with the Linux servers while he handled the development, administration, promotion, video production, testing and content. The founder of Fatpaint also created Web Movie Maker (or Video Maker), a web application for creating video presentations for business, families and individuals. Video Maker allows users to give out the videos for personal or business use in a simple and affordable way. Fatpaint provides free online logo maker, graphic design, vector drawing, photo editor and paint design in English, Danish and Portuguese. Users can change photo colours by manipulating R,G,B and A channels, saturation, contrast, brightness, hue, gamma, sharpness, tint and RGBA matrix. Users can also remove unwanted background and other artifacts by using the paint tools with added effects or by cloning. Multiple photos can be combined into a single image. Users can pick different blend modes and multiple layers. Users can also extract or change parts of the photo by cropping, resizing, skewing, bending, distorting and rotating in 2D and 3D. Hence, users' graphics can be printed on custom products that can be bought and sold for personal and business purposes. Users can choose from 5000 vector images or draw vector graphics and art from scratch, using Fatpaint's vector shape creation tools. It also provides advanced symmetric vector transformation in 2D and 3D as well as support for colour gradients. Multiple drawings can be combined to form complex vector shapes. Different blend modes and effects are supported. Vector drawings can be cropped, resized, skewed, distorted and rotated in 2D and 3D. Similar to Fatpaint's photo editor, vector graphics can be displayed on custom printed products that can be purchased and sold by the users as personal or business uses. Fatpaint has full support for Pen Tablets and users can pick pen, brush, airbrush, paint bucket, clone painting, eraser and smudging tools. Fatpaint offers 8 palettes for painting, plus 13 palettes when clone painting. Fatpaint allows users to import or create their own brushes and thousands of free clipart drawings and brush sets that have dynamic brushes, effects and blend modes. Paintings can be combined in different layers and objects. Similarly, paintings can be cropped, resized, skewed, bent, distorted and rotated in 2D and 3D. Moreover, the graphics can be displayed on custom printed products which users can buy or sell for personal or business uses. 3D Text objects: Create photorealistic, ray-traced 3D text logos and images. Image objects: Paint on multiple layers, import or create your own brushes, clone painting, and painting with effects. Vector drawing objects: Create vector images using multiple paths. Rich text objects with 981 fonts. Effect objects: Blur, Drop Shadow, Glow, Gradient Glow, Bevel, Gradient Bevel, Color manipulations. Page layout: Create multiple pages with a size limit of 64 megapixels, and arrange graphical objects on created pages (each object can be up to 7.8 megapixels in size). Nest graphical objects and transform them into 2D and 3D. Skew, bend and distort images and text. Design, purchase and sell custom-printed products. Fatpaint can send the projects to a printing company. Fonts, public domain images, cliparts, and brushes. Fatpaint is owned by Mersica (also the developer of MakeWebVideo). ^ Duffy, Jill (June 21, 2011). "Fatpaint Review & Rating". PC Magazine. ^ "Fatpaint: Advanced Image Editing, Vector & Paint Application". MakeUseOf. December 3, 2010. ^ "FatPaint: Free Online Drawing, Painting, and DTP Software". I Love Free Software. November 23, 2010. ^ "Fatpaint". PcWorld. May 12, 2011. ^ "Fatpaint". Rtp (Portuguese public service tv-station). January 22, 2011. ^ "Interview with Founder of Fatpaint", doeswhat, April 7, 2011. ^ "Mario Gomes Cavalcanti". Crunch Base. Retrieved April 9, 2013. ^ "INTERVIEW WITH MARIO CAVALCANTI (FATPAINT)". doeswhat. Retrieved 12 February 2013. ^ "Video Maker". 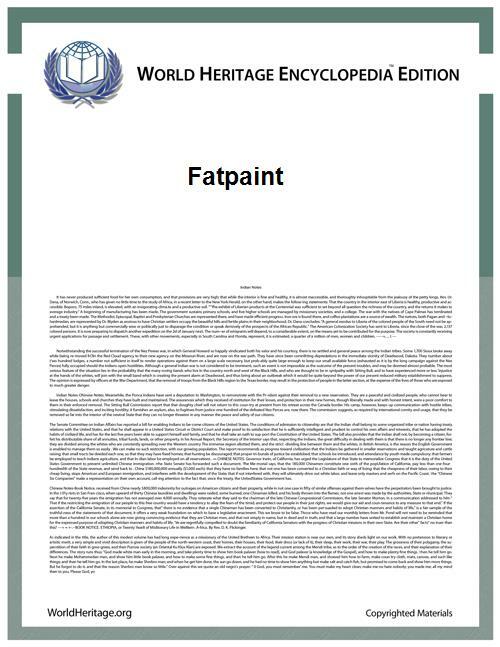 Fatpaint.com. Retrieved 12 February 2013. ^ "Image and Photo Editing Features of our Graphic Design Software, Fatpaint". Retrieved 12 February 2013. ^ "Vector Drawing features of our Graphic Design Software, Fatpaint". Retrieved 12 February 2013. ^ "Paint and Picture Coloring Features of our Graphic Design Software, Fatpaint". Retrieved 12 February 2013. ^ "Free Graphic Design & Painting Software". Pro Digital Tips. December 20, 2010. ^ "Two Best Free Online Vector Editing Tool". CallingAllGeeks. May 3, 2011. ^ "Full-service online graphic design & photo editor- buy or sell your creations". Free Internet Apps. April 20, 2011. ^ Mersica Inc (2012). "Explainer Video Production Online - Make a business promo video". Make Web Video. Mersica Inc. Retrieved 10 July 2012. "Mario Gomes Cavalcanti | CrunchBase Profile". Crunchbase.com. Retrieved 2013-07-23.